Posted on November 16, 2014 by Alicia Bay Laurel	in Blog, Recipes. I invented a new twist on cranberry relish. 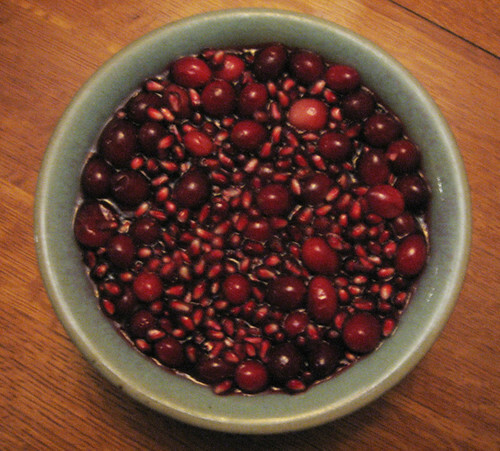 I mix 8 ounces of thawed whole (organically grown) cranberries and all of the seeds of a fresh (organically grown) pomegranate in a bowl, and pour over them a steaming cup of unsweetened (organicallly grown) cranberry (or pomegranate) juice (sweetened with a couple dropper fulls of stevia glycerite) inwhich a heaping tablespoon of agar flakes have been dissolved (simmer 3 to 5 minutes over a medium flame). One hour in the fridge and it becomes cranberries and pomegranate in aspic. ← What Did the Hippies Want?